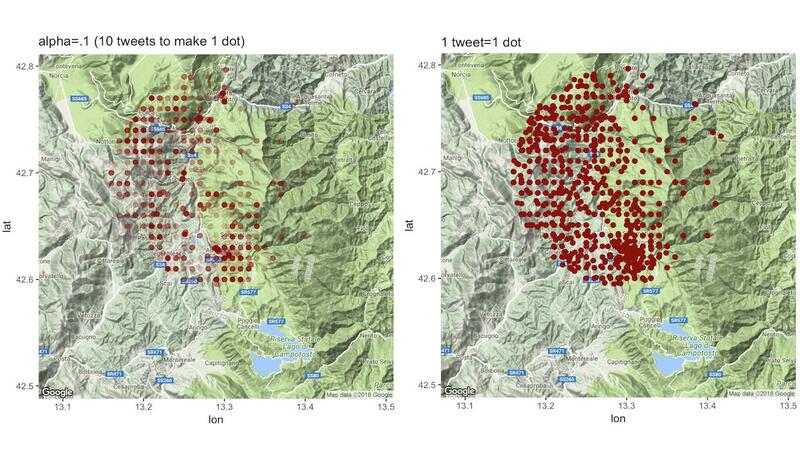 I'm plotting some geolocations (lon, lat) of tweets collected using the Stream API with a 7mi. radius. The picture below shows two maps of the same data, but using different alpha/transparency for each observation. Looking at the map on the left, I noticed that the geolocations follow mostly a sort of imaginary "grid" with specific nodes. Anyone could help me to understand why this pattern surfaces? "loc: 42.7388,13.1798"         "loc: 42.6252,13.2948"         "loc: 42.6008,13.293"          "loc: 42.73,13.2028"
but my question is why these roundings occur since I assumed that the Twitter API would guarantee the same level of precision? I have looked at tweets to some extent. But not in your area. But I suspect this is down to two types of tweets. Actual tweets that fall into two categories. 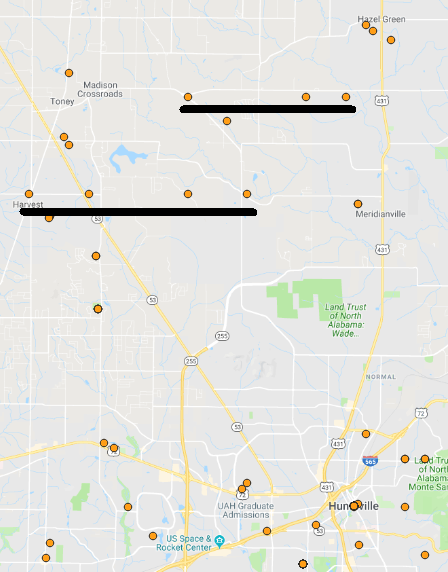 The correct geolocation with specific precision (see the tweets in the urban area), and town level geolocation (see the stacks in the urban area). The tweet highlighted above the black lines are all from an automated flood alert system. I would check your data first to see if there are any trends. Not the answer you're looking for? Browse other questions tagged r geolocation twitter or ask your own question.